No, you’re not reading Japanese as English: this is the European cover of Lode Runner. The Lode Runner has a damnable existence: he’s either trapped in a series of mazes, forced to collect gold and outrun guards by some unseen hand, or he’s a douchebag stealing another society’s precious belongings. The former option destroys the spirit, the latter option destroys the soul. What a life, huh? Thank goodness Lode’s gold-snatching antics are so enjoyable, then. Otherwise, it’d be damn depressing to consider why he’s doing what he’s doing. I’ve never felt so alive and dead within the same moment. In Lode Runner, you play a tormented soul/treasure hunter who must collect every pile of gold he sees on-screen (in the SG-1000 version, the gold looks like wee peppermint candies). There are fifty levels comprised of bricks, ladders and suspended poles. There are also anywhere between three and six guards, er, “guarding” the gold on any given level. The guards will pick up and drop gold anywhere as they see fit, because it’s probably theirs to begin with. Though Lode is always out numbered, he’s able to dig holes in the brick for the guards to fall into. Once lodged firmly in the hole, Lode can walk over said guard like a boss. Also, if the guard had any gold when he fell into the hole, it will automatically pop out of his person. Woe be to the Runner who runs too quickly over a guard after he falls in the hole, for he will fall in after the guard. If the guard is about to emerge from the hole while the Runner is climbing over him, the guard will pull him down into the hole. The holes eventually close, though, so if the guard is still in the hole when it closes, he will die and regenerate randomly at the top of the screen. Often you’ll have to dig hole upon hole to reach gold buried underneath layers of brick, which can be a nuisance when you have guards honing in on you from every direction; such is the life of a gold hoarder. Once all the gold is collected, a separate ladder will appear and the Runner can climb to temporary freedom, bonus points, and puzzles beyond. Just in case you forgot who wears the daddy pants. Unfortunately, the SG-1000 Lode Runner port is a bastardized version of the original computer game and nowhere near as rewarding as Hudson Soft’s NES port. 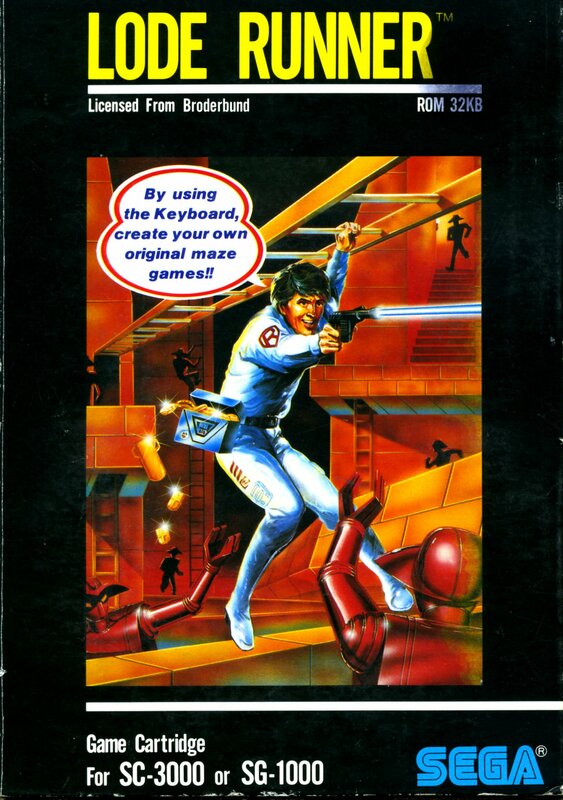 Both the NES version and the SG-1000 only have fifty levels compared to the computer’s 150 levels, but Hudson Soft makes up for the lack of content by adopting Lode Runner into their company aesthetic. The graphics are brighter and cuter, the sprites squattier, the levels are practically widescreen, and the guards are ably played by Bombermen (if you beat the Japanese version of Bomberman, Bomberman morphs into Lode Runner, further confusing the official Lode Runner origin story). The SG-1000 port actually looks worse than the original – little details on the Runner and the guards are missing – yet runs egregiously fast. The game’s so fast, in fact, that if you’ve been raised on the computer or NES versions, you’ll have to re-learn how to play. The timing of the guard’s movements, when to dig the holes to trap the guards, and the order in which you collect the gold all become a crapshoot. After about fifteen minutes, I did get used to the game’s speed, but I still don’t understand the reasoning behind the increase. Since both NES and SG-1000 versions were released in 1984, one would assume they have the same basic features, but no. 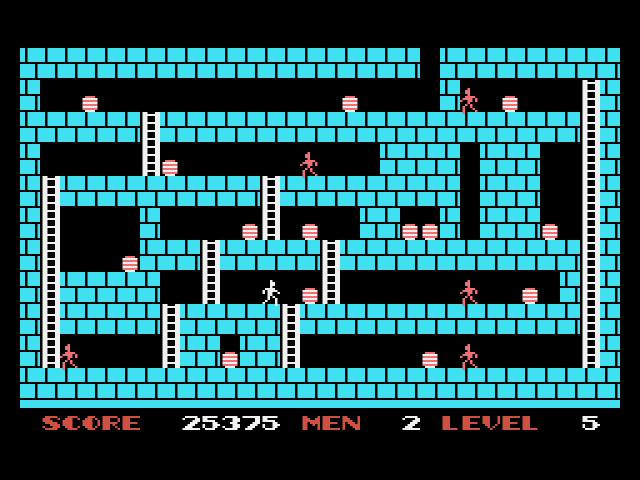 NES Lode Runner has a two-player alternating option and a Level Editor. The latter doesn’t mean much without the Japanese-only Famicom Data Recorder to save your levels, but it’s still a nice touch. 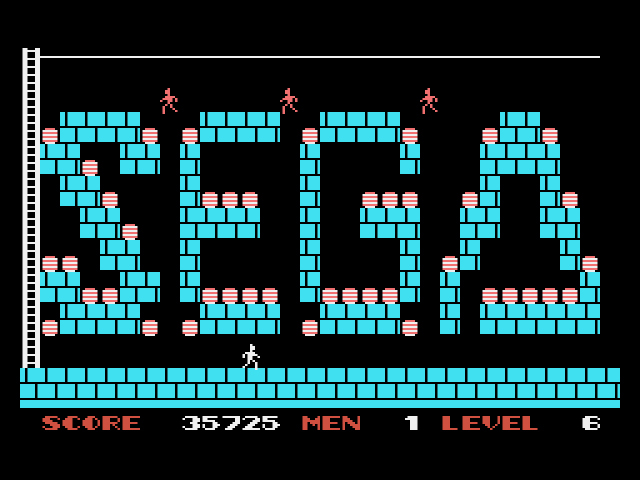 In comparison, the SG-1000 only has one-player, stick-men, sped up and coked out. Still Lode Runner if you look at it from a certain angle, but boy, has it seen better days. Lode have mercy. Very interesting that this was developed by Compile (I’m a huge Compile fan). Do you know if they were involved with any of the other Lode Runner ports? After a quick Google search I don’t see anything to indicate one way or the other. Very cool! I’ve only really started to pay attention to developers of a lot of the games I enjoyed back in the day (and discovering hidden gems from my youth) and it is really interesting to see how many good games Compile had a hand in.